In my mind I’ve often likened the qualities of literature to the influence of spirits-- in both meanings of the term: an agent at work in our lives that has the ability to both intoxicate us and to haunt us. Lewis’s Main Street often goes down more like Robitussin than Glenlivet, but though the novel has stretches wherein one suffocates along with Carol Kennicott more than one would prefer, there is always some subtle variation on the mundanity that besets Lewis’s heroine for the reader to contemplate. Though they come at points where the reader may well feel at the end of their endurance, Lewis does enrich the experience with much-needed alternative perspectives from the supporting characters. Just when one feels that there is no possible break in the town’s small-mindedness and meanness, Lewis transplants his narrative voice behind the eyes of Carol’s house-girl, her best friend, and then her husband. Though these characters have their own shortsighted conclusions, the overall picture they give when set alongside Carol’s existential agonies provide blessed wafts of fresh air to the novel. 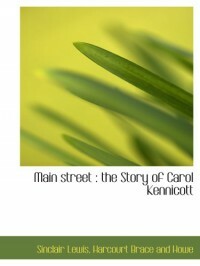 The protagonist, Carol Kennicott née Milford, is an intelligent young woman, but also a self-conscious and a fearful one. She is neither Mary Sue nor unreasonable shrew. Lewis’s depiction of the Midwestern small town likewise balances empathy and criticism. One must admit that Lewis’s criticisms of Gopher Prairie do outweigh his compliments, and the book is foremost a nigh unforgiving satire. Lewis illustrates in galling detail the stew of puritanism and materialism that comprise Gopher Prairie’s culture. As Carol navigates a gauntlet obnoxious townsfolk over the course of several years, Lewis anatomizes nearly ad nauseam the gossip, sexual double-standards, exploitative local politics, jingoism, and self-righteousness that often carry the day on Main Street. By the time the final page has turned, the picture of the American small town that Lewis has painted is obviously not a saccharine ode to God’s Own Country, but neither Carol nor Lewis himself have lost hope. Carol grows to understand that as loathsome as a certain society can sometimes be, never is that society comprised of people who cannot and will not change. Neither does change come at our every beck and call. It is something that is often brought about slowly, and with great endurance, and no small dose of perspective and humor, not just about the world around us, but about ourselves. I wouldn’t say that Main Street is a delight to read. The humor is often bitter as gall, and the reprieves from anxiety and frustration that we feel through Carol often come later than one might like. At its heart, however, the novel is one written with compassion, and the heart feels sturdier and wiser for having read it.